After much consideration I have decided to make an important move with Platform Builder Pro. In the past, Pro has been distributed as a separate program. Now with the upcoming release on Steam, Platform Builder Pro is becoming a DLC which unlocks all of Platform Builder's features. In other words, Platform Builder will run as Platform Builder Pro after the user acquires PB Pro for his/her Steam account. The obvious downside is that anyone who wishes to use Pro will need a Steam account. The upside is that you don't have a separate program to download, and Platform Builder Pro cannot be illegally distributed so easily. It may be a difficult move for some of us, but I believe that it will help streamline the process and look more professional to help to secure PB's future. Keep in mind that Steam is the world's largest distributor for digital gaming by far. If you're reading this, then you're probably into gaming. If you're into gaming, then you probably should have a Steam account. 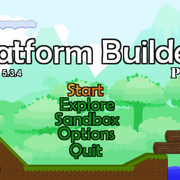 If you already own Platform Builder Pro on GameJolt or itch.io, you will have the opportunity to receive a free download key on Steam for Platform Builder Pro. Soon, I will release another patch update for Platform Builder which allows Pro users to request a download key for Steam from the main menu by supplying their email address. If everything checks out, I will write back to the email address you provide with your download key and further instructions. If you don't already down Platform Builder Pro, you are welcome to pre-order on Steam. I can't guarantee that the price will always stay the same. Let me know if you have any questions or concerns. My desire is to make this transition as easy as possible for all of us. Also, I forgot to mention that this offer for a free key expires November 1st, 2018! So please don't delay and make sure you get your request out before the deadline. Thanks! Just joined! I friended Ting Thing, (I'm pretty sure I did!) and am wanting to get Pro. How do I get my Game Jolt key? (I use Game Jolt) or do I have to wait till the 31st? Wow! We can join, and talk to each other while we use PB! This is going to be awesome!!! Okay. I know you're writing a message Ting, I will respond, so please stay online! Wait until I release a small update for Pro on Game Jolt in the next few days. Once you get the update, download from GameJolt like you normally do and you'll see a new option to request a steam key. Great! I waited sooo long for this response! Could you friend me right now Ting Thing on steam? I can't do it myself because I have to pay 5.00$ to unlock that! It was just explained. We wait for a patch, and then a link in the program will say: get steam key. We do as it says, then we can use PB pro on steam! Remember, it comes out o August 31st. I don't know when the patch comes out. Check coming soon and the other announcement related to this to catch up on what's going on. The Patch is out now. This offer is only available for those who already own Pro. I'm actually not sure if you own Pro, but if so, then my first post should explain it. Got the steam key button clicked! Just give your e-mail, and then Ting Thing will send PB DLC (formerly known as Platform Builder Pro) and boom! PB on steam! We're still calling it Platform Builder Pro. It's just that Pro comes as a DLC (Downloadable Content) instead of a separate program. Basically, Platform Builder will check your Steam account to see if you own the DLC, and if so, it will run as PB Pro.